The Jewish War Veterans Martin Hochster Post #755’s 2019 officers are, from left, Kim Factor, post bugler; Rabbi Sidney Zimelman, chaplain; Phil Kabakoff, judge advocate; Will Kutler, junior vice commander; Nana Atkens, commander; Mike Bumagin, senior vice commander; Michael Ross, quartermaster; and Fred Korngut, officer of the day. Linda Landy, adjunct, is not pictured. 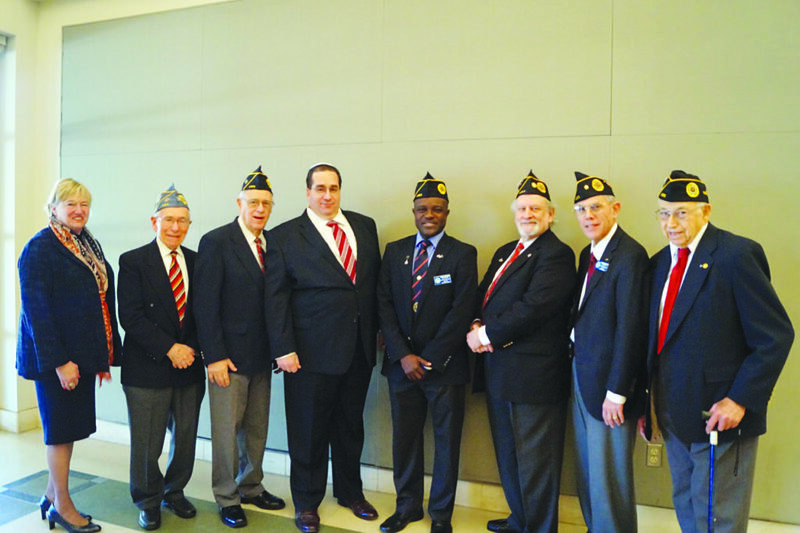 The Martin Hochster Post 755 of the Jewish War Veterans of Fort Worth installed its 2019 officers Sunday, Jan. 6, at Beth El-Congregation. Assuming their new duties were Commander Nana Atkens, Senior Vice Commander Mike Bumagin, Junior Vice Commander Will Kutler, Judge Advocate Phil Kabakoff, Quartermaster Michael Ross, Chaplain Rabbi Sidney Zimelman and Adjunct Linda Landy. • Closely backing and supporting Naval Air Station and Joint Reserve Base, Fort Worth. • Interacting with the USS Fort Worth (participated in ceremonies and interaction with commander, officers and crew). • Participating in ceremonies and interacting with Charlie Company, a Vietnam-era veterans group adopted by the City of Fort Worth. • Member and past president of Texas Mayors of Cities with Military Bases (founding member together with the City of Fort Worth). • Participating in Memorial Day ceremonies at Mount Olivet Cemetery and the National Military Cemetery. • Sponsoring initiatives with homeless veterans to get them housing and settled. Price’s latest endeavor was The 100-Day Challenge, an initiative to house 100 veterans in 100 days, culminating Dec. 21, with 181 veterans housed. The first recipient of the Morton Herman Service Award to Veterans was State Sen. Wendy Davis in 2010. Those who followed were Judge Brent Carr (2011), Stevie Hansen (2012), Nikki Hatley (2012), Rep. Pete Geren (2013), Rep. Kay Granger (2014), Valerie Groll (2016), Councilman Jungus Jordan (2016) and Admiral Woody Beal (2017). Two World War II veterans, Stan Kurtz and Irwin Raffel, were recognized. And veterans who had passed away in the last year — Arvie Cooper, Earl Givant, Ted Hoffman and Harry Kahn — were remembered with a moment of silence. Bejarano-Gutierrez is a graduate of the University of Texas at Dallas, from which he earned a Bachelor of Science in electrical engineering. He studied at the Siegal College of Judaic Studies in Cleveland and received a Master of Arts degree with distinction in Judaic studies. His master’s thesis focused on Jewish Identity in the Second Temple Period. He completed his doctoral studies in 2015 at the Spertus Institute of Jewish Learning and Leadership in Chicago. His doctoral dissertation “Complex Identities: Christian and Jewish Attitudes Towards Conversos” was accepted in September 2015. He also studied at the American Seminary for Contemporary Judaism and received rabbinic ordination in 2011 from Yeshivat Mesilat Yesharim. Bejarano-Gutierrez served as the assistant editor for HaLapid, the quarterly publication for the Society for Crypto-Judaic Studies, from 2011-2012. He also served as a board member and treasurer for the Society for Crypto-Judaic Studies from 2011-2013. Bejarano-Gutierrez served as the volunteer rabbi of Chavurah Zohar Yisrael, a traditional Jewish community with rotating services, serving South Dallas and Northeast Dallas counties, with a special focus on helping Hispanics of Crypto-Jewish ancestry. Chabad of Fort Worth will host a Shabbat dinner and lecture with Rabbi Yehuda Shurpin at 6 p.m. Friday, Jan. 18, at the Sonnenschein Chabad Jewish Center. Shurpin’s topic is “the Jewish View on Reincarnation.” There is no cost to attend, but a reservation is required at rabbi@jewishcowtown.com or 817-263-7701.